Are You Ready For A Junk Free Holiday? Over the next coming weeks, there will be a lot of things coming into your home. On the short list is a turkey for Thanksgiving, a Christmas tree for Christmas and all kinds of friends and family for parties and visits. Before that happens, you should focus on all the things you can take out of the house. That would be any junk or rubbish item that is taking up valuable space and making your home look cluttered. To get that stuff gone in a flash, you only need to hire Junk King Dallas for a single session. What you want to get rid of is entirely up to you. Just know that you don’t have to limit yourself by size or weight. The two man moving crew assigned to your session will be able to lift and load anything you “throw” at them. They love a good challenge. One crew even cut an entire hot tub in half just to get it onto the truck. Talk about problem solving! Weight isn’t a factor with regard to your price, either. You’ll never be charged by the pound with Junk King Dallas on the job. Their pricing policy is structured to reflect how your stuff will fit on the back of their truck. This is an estimate that is presented before the work begins. There won’t be any surprise charges at the end of the job, either. And one fee covers everything from the labor, transportation and disposal. That disposal is also determined by the crew. Not everything you’re getting rid of is going to end up in a landfill. If the crew spots an item that can be recycled or donated to a charity, then they will strive to get that item to the proper drop off. If they can avoid going to a dump, then Junk King Dallas considers that to be a good day. Think of how much better you’ll find once all your unwanted junk is cleared out of your home. Even if all the rubbish is in the garage, it will still make a world of difference. 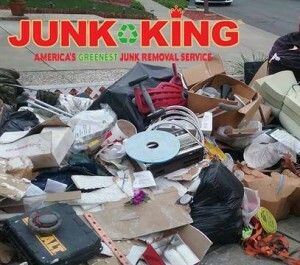 Kick off your holidays with a junk free home thanks to a little help from Junk King Dallas. This entry was posted in Dallas Junk Removal and tagged holiday, Junk King, junk removal on October 31, 2017 by Junk King. Last updated October 31, 2017 .